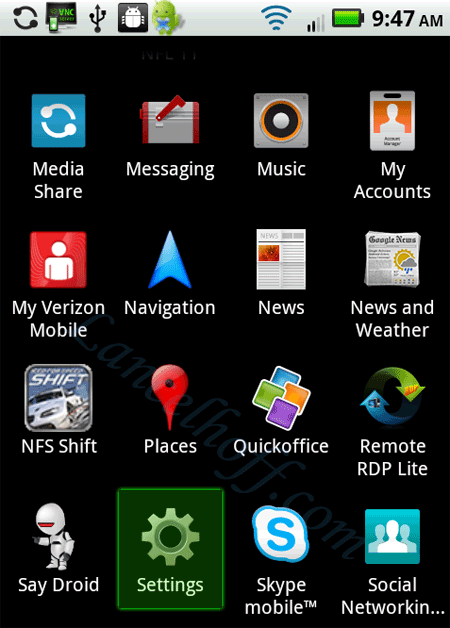 In the following simple solution, I cover the process of resetting a Droid X, and other Android OS smart phones to “Out of the Box” Factory Settings. This process is the equivalent of reformatting, and reinstalling an Operating System your PC. All data will be wiped, and a bare Android Operating System reinstalled. You might want to use this Droid Reset process to reset your phone back to factory default, after having made changes, modifications, or installing a lot of experimental applications. It is also a good idea to Reset Your Droid if you plan to sell your phone or return it. Note: The data on your SD card still remains, and you would need to use another process to remove that data. Choose the “Factory Data Reset” option, to erase all data on your phone. The Droid Hard Software Reset process will take several minutes. Once complete, your Droid will be reset to factory default settings, just as it was new, when first taken out of the box. In fact, you will be prompted to activate your Phone, just as was done when it was new.